Hydraulic power units are designed to convert mechanical power, in the form of air (pneumatic), electric and gasoline energy, into fluid power, which every hydraulic system needs to function. This fluid power can be used in a variety of both mobile and static operations. Input energy to drive the power units can be provided, simply, by a standard air compressor. Power units bring together all instruments and tools required to generate pressure into a compact unit. They are usually affixed to a single plate or made into compact, self-contained rugged tubular units. All the components must work in unison to ensure efficient and safe operation of the hydraulic system. Smaller applications for hydraulic power units include rubbish compactors, backhoes, Jaws of Life devices, amusement rides, diggers, loaders, excavators, graders, and car lifting devices. Other special uses are bolt tensioning as well as burst and hydrostatic testing. Modern hydraulic power units comprise of components that, individually, have to perform different functions. The prime mover (air compressor) must provide the primary energy, and torque, that the pump needs to displace fluid and generate pressure. In the larger industrial hydraulic systems, more than one pump can be used. However, in most of these applications only one pump will run at a time. 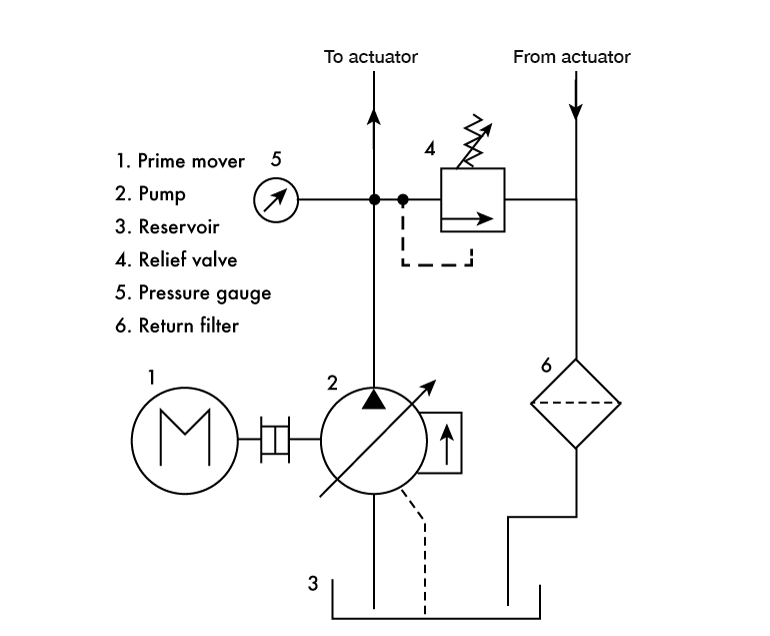 Multiple pumps make sense in applications where there must be a continuous supply of pressure. These are applications where pump failure will cause an almost immediate breakdown of the hydraulic process and that of the processes down the line. In most designs there is also a reservoir, or fluid storage tank, from which the fluid is pumped and collects after it is recycled from the actuator and the relief valve. The best reservoirs are made from stainless steel or polyethylene for corrosion resistance and long service life. The relief valve itself channels away any excess pressure back to the reservoir. It acts as safety device that protects the actuator and the equipment it powers. Without it, the entire system is made unsafe, even for the people who operate it. A pressure gauge, positioned before the actuator and adjacent to the relief valve, is also an important power unit safety device. It measures the pressure generated by the pumped fluid. A filter cleans the recycled fluid before it can be drained back into the reservoir to be pumped back again. Filters are important for ensuring that contaminated oil does not return to the reservoir to be circulated again. Up to 90 percent of hydraulic system failures are attributed to contaminated oil. Among the most common contaminants is water, which condenses from the air that is ingested into the hydraulic system. In systems that sometimes stay idle, this water can encourage biomass growth. Biomass in the oil reservoir presents corrosion risks. It is also slimy and foul smelling. The fluid tank must have enough capacity to contain the fluid being pumped, that which is already in the pipes, as well as that which is in the actuator, should it need draining. The size of the tank is determined by the capacity of the pump, the amount of fluid being used in the system and the pressure requirements of the hydraulic system itself. Some hydraulic power units may also include temperature control devices. Heaters and coolers are important where power units are to be used in areas where temperatures tend to fluctuate between extremes. They help to maintain fluid at a consistent temperature as excessive heat or cold can cause contamination and alter the quality of the fluid circulating in the power unit. Systems run in hot and humid conditions will also need cooling to stop them from ingesting humid air from which water can condense and contaminate the oil. In such cases, the over-heated oil tends to thin and leaks become a real concern. Overheating also causes high oil lubricity, which degrades its strength. On the other hand, oil that has too little lubricity and too much viscosity encourages friction. The consequence is faster wear and tear for all the moving parts within the hydraulic system. The filter should also remove solid particles from the oil as these also cause friction. You can find hydraulic power units, both standard and custom designs, with a suction strainer, oil level gauge with a thermometer, and other features. Accumulators can also be an important part of larger hydraulic systems that complement the work of the power units. In the event of any component on the hydraulic system fails, the accumulator is designed to provide backup pressure while the operation is safely shut down or the power unit is restarted. Any one of the prime mover, pump, or relief valve can fail, affecting safe or efficient operation of the entire hydraulic system. Leaks can cause the loss or minimization of pressure the actuator needs to energize pneumatically powered machinery. For operational environments that are susceptible to pulsations and uncontrolled pressure fluctuations, an accumulator also helps to maintain pressure at levels the hydraulic system requires to operate safely. Just like a relief valve that drains excess pressure, accumulators supplement pressure where the pumping system supplies inadequate pressure. 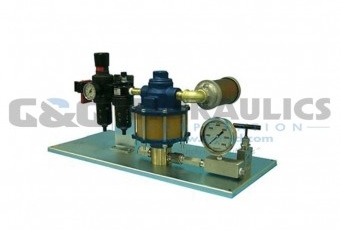 Accumulators also enable operators to use a smaller pump than would normally be needed. This enables savings in energy and maintenance costs. The cost of acquiring and servicing a large pump is markedly higher when compared to a smaller one. Energy savings in particular are pretty significant considering that lifetime energy costs will far outstrip the cost of the power unit. However, on smaller, static type benches, accumulators are not needed. High flowrates are where the accumulators are truly useful. For something that’s become such a staple of almost every industrial installation, it is perhaps not necessary to even talk of the benefits of using hydraulic power units. It often isn’t possible to have an industrial plant to talk of without first investing in the right hydraulic power units. Though it does not affect a power system’s efficiency, the design of a power unit has a direct bearing on its cost of operation. For example, power units with a vertical design have excellent space economy and are a great convenience for operations where floor space is limited. There are also other power units specially designed for rugged use and other challenging environments. Examples are those used in outdoor environments and on mobile equipment in agriculture, construction, and fisheries. The assumption is that your new hydraulic power unit is the right fit for your application. As it arrives, your power unit would obviously have been packed to ensure it arrives undamaged and ready to be installed. To ensure there is no contamination, all the power unit’s open ports will have been plugged. We recommend you do not unplug them until you are ready to install the power unit. If you are not going to install the power unit immediately, try and keep it indoors, and covered, to protect it from dust. Ideally, power units should be located indoors, where they can be adequately protected from the elements, unless they have been properly weatherproofed for outdoor use. There will likely be a water cooling or other temperature control mechanisms provided. Connect these, following guidance from the installation manual. Ensure all interconnecting pipes are where they should be and fill the reservoir with a compatible fluid. As a best practice, it is recommended that you pump the fluid using a pump fitted with a 10 micron filter to ensure the fluid is free of any contaminants. It is important to set up a maintenance schedule that you stick to. Waiting until you notice a drop in your power unit’s performance before you can institute maintenance is not a good practice. Lack of maintenance, such as quarterly oil changes, are similar to a cars oil change and can become expensive as internal damage occurs from dirty oil. Any equipment with moving parts needs to be lubricated constantly to protect them from wear caused by friction; power units are no different. Use lubricants recommended by the manufacturer. Filters and suction strainers need to be cleaned regularly to make sure they don’t get clogged. It is critical that the oil you have is compatible with the power unit. Check with the power unit manual. Ensure you also maintain the recommended oil level, so the power unit never runs low. Importantly, take oil samples from the reservoir regularly and compare them with fresh, unused oil to see if it needs changing and how fast it is degrading. Dirty oil usually points to poor filtering when filling the reservoir, pipes left uncovered while servicing the power unit, and lack of air breather or one that’s left open, among other don’ts. A darker oil color indicates overheated oil, which has its own consequences on the efficiency of the hydraulic power unit. There are many suppliers of hydraulic power units. But with a wide choice of suppliers comes the risk of ending up with poor quality power units. Worse still, you can install power units from manufacturers with a poor spares backup, which will give you endless headaches every time your power units break down. SC Hydraulic Engineering Corporation is one manufacturer with a proud history of making power units and related hydraulic equipment of the highest quality. Besides power units, the company also makes air control and air pilot switch valves, air operated gas boosters, and different types of liquid pumps. The company, established back in 1953 and headquartered in Brea, California, has built a reputation for its extensive range of power units. It manufacturers power units for many different applications. As well as its extensive range of standard models, SC Hydraulics also takes orders for custom power unit designs that speak to the specific needs of your particular application. Among the series the company markets are the 30, 40, 50, and 60 series, with up to 100 different models between them. Also among the models is the 90 series that is made to be portable. If you work outdoors and in particularly challenging conditions, the more rugged tubular model should interest you. The tubular power unit features a cold rolled, heavy duty steel frame as well as a highly durable polyethylene reservoir. At between 30 and 40 pounds, the tubular power unit is also remarkably portable. These power units are convenient for use with your mobile agricultural equipment out in the fields. Our hydraulic power units aren’t just portable, which is vitally important if you work in the field a lot. They are also built tough to withstand harsh operating environments. The rugged build quality extends to the tubular frame that encases the power units. The tubular frame is made from cold rolled heavy duty steel that is finished in a hard wearing powder coated paint. These all-in-one pressure powerhouses are equipped with the usual hydraulic system staples as well as a durable 7.5-liter hydraulic fluid reservoir, air controls, bleed valve, and a high pressure gauge.